In preparation for my first FULL week on the Whole30 I have made my list of meals, gone to the store, and started getting ready for the week. For the first time in its whole life, my fridge is stocked with more fruits, veggies and meats as opposed to beer, cheese and, well, more cheese! 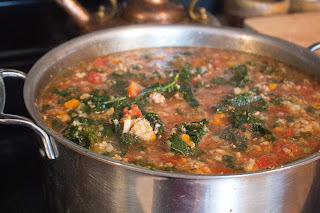 Since my schedule is always up in the air, things I can take on the run with me and heat up are most effective and convenient so I thought I would start the week with a huge pot of soup so I could have that for lunch or dinner throughout the week. I am also working on chicken salad, avocado egg salad, and lettuce wraps but we have to start somewhere so here 'tis! Add the shallots, garlic, celery, carrots, cauliflower, and bell pepper.